What kind of intolerant toe-lacker doesn’t like ice cream? Not me. 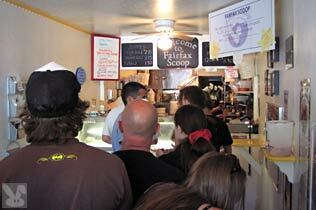 When I want a frozen treat in Marin I don’t waffle around. Service: Super friendly and efficient. They have a line out the door when it’s hot or if it’s the weekend. They're open 'till 10pm every day, so they make an excellent alternative to the dessert at whatever restaurant you're dining in nearby. Flavors: They only serve 8 flavors. Four of them are always on the menu: vanilla, chocolate, strawberry and vanilla honey lavender. The other four rotate but always include a sorbet and a soy alternative. Green: The couple who run this place are environmentally conscious. The disposable spoons are biodegradable and they encourage you to use the non-disposable flatware if you stay in. The tasting spoons are metal so they don’t have lots of plastic litter. They let you pick 2 flavors for a single cone. Here’s one with chocolate and vanilla fudge and one with chocolate and coffee. The chocolate is rich and creamy. Their coffee ice cream has a nice strength to it. The vanilla fudge is great for someone who is suffering from chocolate/vanilla decision paralysis, a nice rich ribbon of chocolaty fudge cuts through the silky vanilla. Also not to be missed are the raspberry and cantaloupe sorbets. Yum. The cones and waffle cups are house made and have a satisfying crunch. 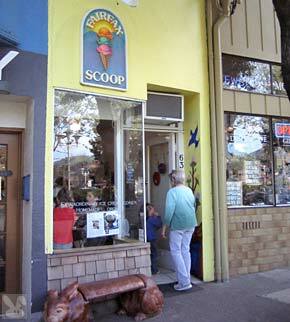 They make all of their ice creams and sorbets on site in small batches with fresh, organic ingredients. 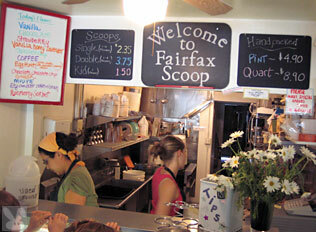 They use Straus Creamery cream and milk (just like another favorite product of mine – Cowgirl Creamery Cheeses.) They have fun flavors but always have their chocolate and vanilla if you don’t feel like anything exotic. 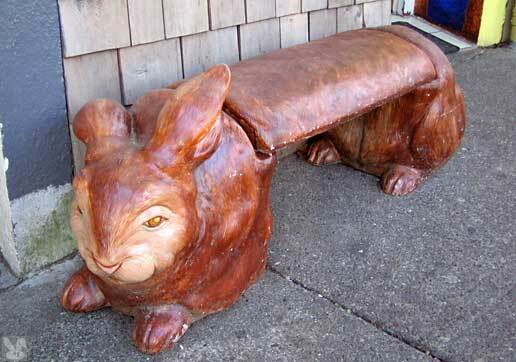 They have a bench outside that is shaped like a bunny, obviously the product of a twisted mind. If they didn’t serve the best cone in Marin I wouldn’t put up with this defamation towards bunrabs, but I will give them the benefit of the doubt and think of that bench as a sideways totem pole that ignorant people abuse. Three carrots out of four. 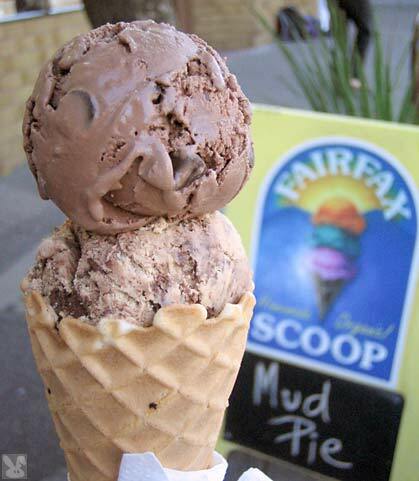 Fine ingredients and an attention to detail make this house-made ice-cream a real winner. One carrot off for the lack of proper respect for BunRabs. Entire contents copyright © 2005 by BunRabCo. All rights reserved.